The Washington Capitals visited the White House to be honored as Stanley Cup champions. WASHINGTON — Collusion may have been ruled out. Nonetheless, three Russians visited the White House Monday afternoon. 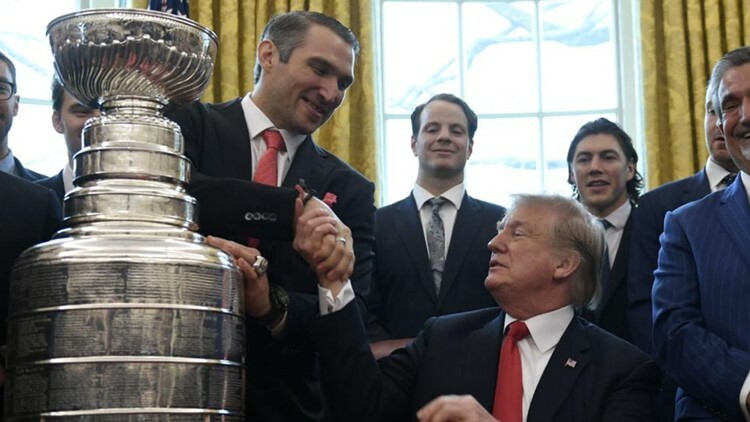 And irrespective of your politics, Alex Ovechkin, Evgeny Kuznetzov and Dmitri Orlov -- and all but two of their current Washington Capitals' teammates -- decided to visit the Oval Office as a team and not get too wrapped up in whether their decision was right or wrong, whether or not they're viewed as supporting Donald Trump or merely playing tourist in America's most hallowed home. Either way, if you ever believed we can still just "stick to sports" and leave all the things that corrupt and dilute the power of the games behind, all you had to do was go to Ballston, Va., this past Friday morning, a few feet from an ice rink full of the sound of whirring pucks smashing against the boards. "In the end, I never really came up with a situation where I would feel comfortable going," Holtby said, his voice laced with conviction. "My family and myself, we believe in a world where humans are treated with respect regardless of your stature, what you're born into. So, I think that's just where it’s at in terms of this decision. You're asked to choose which side you’re on and I hope it’s pretty clear what side I’m on." Between teams of LeBron James and Stephen Curry boycotting a combined three visits, the Philadelphia Eagles fielding such a small group that their visit was canceled, and all the other college teams that have also refused to shake hands, smile and present the leader of the free world a jersey with "Trump" on the back, it's become one of the most politically fraught decisions among players, coaches, executives and organizations since 2016. For Holtby, the choice was clear: he is an outspoken advocate of the LGBTQIA+ community, many of whom feel attacked by the president's policies. Brett Connolly, a forward on the team who also declined the invitation, is a close friend of Devante Smith-Pelly, the only black player on the team last season who is now in the AHL, and has said he wouldn't go because of his own issues with the president. You don't have to agree with them politically or otherwise, just as you don’t have to agree with Matt Birk, the Baltimore Ravens' former center who boycotted a trip to President Barrack Obama's White House in 2012 because, as a pro-life advocate in the Catholic Church, he could not bring himself to meet with a man who was pro-choice. But we do need to understand that it's impossible to separate the sports we consume from the beliefs and values of the people who play them. Frankly, President Trump won't let us. He has gone above and beyond, making sports a part of America's culture wars, using the conviction of kneeling NFL players as a proxy for patriotism -- a ploy sadly much of the country bought. In less than two years, no more than five NBA or Super Bowl champion teams have refused to visit, or were disinvited, because, well, this president is that polarizing. By the time Ronald Reagan hit Ricky Sanders on a slant pattern on the White House lawn in 1987, celebrating Washington’s Super Bowl victory, the tradition of inviting championship teams to the White House was cemented, and the tradeoff felt worth it: One town's beloved athletes got to visit the halls of American history and one nation's president got to bask in the reflected glory of those champions. Manny Ramirez couldn’t make it in 2004 when the Boston Red Sox visited to celebrate their first World Series title since 1918 because his grandmother was sick. When he missed the ceremony again in 2007 after the Red Sox won, President Bush couldn't help himself. "I guess his grandmother died again," Bush cracked, before finally adding, "Just kidding. Tell Manny I didn’t mean it." Now, we must have media gatherings to report a player's decision, and whether that affects the chemistry of the locker room, his relationships with his other teammates who did go to the White House going forward. And the players that go have to make it clear they don't want to miss their chance to be in the halls of history, to appreciate the office of America's seat of power – not necessarily the man currently in it. Holtby was impressive, for what it's worth. Julia Karron from the website Russian Machine Never Breaks summed it up well. "We stick by every single teammate that we have and their decision," Holtby said. "I think our team, we’re trying to take the most professional way we can and give every player their right to choose and stand by each and every one of us, regardless of what you decide." Holtby’s support of the LGBTQ community has spanned his time in Washington. He's marched in two of D.C.'s pride parades, and when he couldn't last year because he was galavanting with the Cup, he was able to snag a pride hat while Brandi attended in person with a rainbow Stanley Cup. Holtby also spoke at the Human Right’s Campaign’s National Dinner earlier this season, and said the Caps are "proof that supporting LGBTQ equality is a winning decision, and we're honored to stand with you in this fight." "My wife has taught me a lot more about it than I knew before, and kind of broadened my views on a lot of LGBT community issues," Holtby told Dan Steinberg of the Washington Post in 2016. "We've just gotten to know people in around the community, and the issues they go through and what they’re trying to accomplish. We've tried to support them in different ways to create equality, basically. It's something that we both feel is an issue that’s close to us, an issue we believe in." "In the end, I never really came up with a situation where I would feel comfortable going. My family and myself, we believe in a world where humans are treated with respect regardless of your stature, what you’re born into. So I think that's just where it's at in terms of this decision. You’re asked to choose which side you're on and I hope it’s pretty clear what side I’m on." Whether you're on his side or not doesn’t matter. The fact that he is able to have that kind of conviction, in an era where a renaissance of social conscience among athletes is starting to mirror the days of Muhammad Ali and John Carlos and Tommie Smith, is important and necessary.